Theo Howard, Earl of Suffolk is torn. Betrothed to a child to satisfy his family dynasty, he longs for the freedom to make his own choice. And when he attends a lavish party at his family’s newly-restored palace, he is immediately attracted to Lucy, a beautiful young lavender-seller. But in this enchanted world of Shakespeare’s Midsummer’s Night Dream, all is not as it appears. Theo’s headstrong sister Frances is determined to sabotage her own arranged marriage, and aided by the cunning of Frances and her friend Barbara St.John, perhaps Theo can find his own path to happiness and true love. When I wrote The Lady of the Tower, the story revealed itself in the narrative of my ancestress, Lucy St.John. But, as with all novels, other characters appeared, and their voices grew strong and insistent, demanding their own story be told. And so, a novelette was born. This is Theo’s counterpoint to chapter six in the novel, in which Theo falls in love. A counterpoint is a melody played in conjunction with another, or an opposing viewpoint in an argument. Our lives are complex, and each one of us carries within us a counterpoint to another’s story. Here is one to Lucy St.John, the lady of the Tower. What a wonderful taste into this authors work, as this is the first I have read by Elizabeth St. John and I will definitely be reading more from her. I hadn’t read her full-length story; The Lady in the Tower but, I didn’t find that to be a hindrance or feel that I had missed out on something as this is very cleverly written. In fact, I found I was intrigued even more by the character’s and the story want to learn more about them and their antic’s. This is a short story which basically follows Theo; Earl of Suffolk as he meets and falls in love with lovely Lucy the Lavender seller. This is written in first person and we see the events through Theo’s eyes. To please his family, he is betrothed to a woman whom his family deem worthy of the Earls of Suffolk dynasty. But Theo is feeling suffocated by it all, he just wants one moment where he can do what he wants and for a few moments be who he wants to be. Which is when he meets beautiful and spirited lavender seller; Lucy St John at a party at his families newly refurbished home. He is instantly drawn towards her, but with his tenacious sister Frances set to cause a scandal, will Theo have the future he wants with Lucy? What a wonderful little peek into another’s world, that is how I saw this when I read it. I have never read a ‘counterpoint story’ before and I thoroughly enjoyed the sneaky dip into Theo and Lucy’s world. What I particularly like about this is that it is loosely based on the author’s ancestry, something which I can relate to completely as this is something I am doing myself. It is quite the inspiration seeing an author who has taken her ancestry and created a book out of it. I really like that! I found Ms St. John’s writing to be clever and vivid to the senses plus brilliantly detailed that the era has come to life as you read, even though this is a short story you get a real sense of the author’s love for the story and the era. A very enjoyable read, one that gets the taste-buds watering for more. Counterpoint; Theo Earl of Suffolk is available to purchase at Amazon. This entry was posted in Civil War Era Romance, Complimentary copy, Historical Fiction, Historical Romance, Reviews and tagged Complimentary copy, Counterpoint Theo Earl of Suffolk, Elizabeth St John, Falcon Historicals, Historical Fiction, Historical Romance, Review. My goodness me, what a book! This is absolutely superb, it’s fresh and new and exactly how I like my historical romances to be. 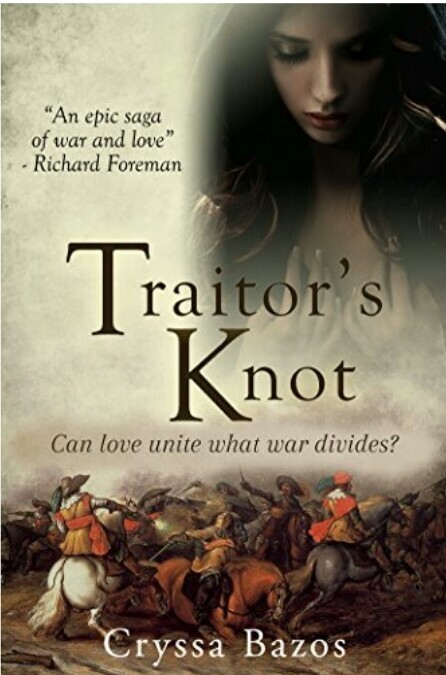 The Traitor’s Knot is the first book I have read by this author, and it won’t be the last. I haven’t read a story from the English Civil war for years and The Traitor’s Knot and Ms Bazos has just re-awakened my interest in the era. This is one of those books that you hear about and read about and instantly like the look of and as soon as you start reading it, from the first page you are hooked – well this is what happened to me when I read this. With the English Civil War at an end with the execution of King Charles I, the country is left in an uneasy and somewhat dangerous stalemate as parliament have control of the country. The parliamentarians are bringing in more and more laws that are making regular peoples lives difficult and the secret royalists are refusing to comply with the new order, which is making day to day living very dangerous for everyone. During the Civil War James Hart was a well-respected and talented member of the cavalry in the royalist’s army he personally aided the Prince of Wales and the future King Charles to get to safety. Now that the parliament are in charge of the country he is now a ostler in a local inn, James is a proud royalist and vows that he will never bow down to that usurper Cromwell. James becomes a highwayman known as the ‘Highwayman of Moothill’ he takes what he can from those supporting parliament and he is putting it away for the day that King Charles II will be restored to the throne. “So you mean to heal me, then?” James asked. “No poultice will draw out that poison.” James smiled wryly. On one of his attack’s as he robs the Reverend Richards – who is a big supporter of the parliamentarian ways and a man that James detests, he meets the spirited and courageous Elizabeth Seton. He is enchanted the moment he sets eyes on her, she is like a drug to him no matter how much he tries he can’t keep away from her. James is such a great character, he is epitome of charming, he’s got a certain arrogance about him but instead of that being highly irritating he is more like a cheeky lad. He is this handsome, mysterious and seductive man who hides behind so many masks not just the physical one he wears as the highway man, He has been through his personal trials and those have stayed with him and made him the man he is. Elizabeth Seton is a healer, she has from her mother the old ways but unforunately due to her how the country is now and who she is – she is the proud daughter of a royalist who died in a uprising – Elizabeth isn’t trusted and unable to use those skills that she has honed. After the death of her beloved father – an act which has brought bad tiding on to the Seton name, then when her mother dies of a broken heart Elizabeth realizes that she no longer stay n her child hood home, the only home she has ever known she is stuck in a rut there is no way she is going to go and live with her sister and her parliamentarian brother-in-law so she goes to live with her aunt Isabelle; her mother’s sister. Once there she finds that all isn’t as peaceful as it may seem, there is danger and evil lurking behind every corner. On her way to her aunt’s her carriage is stopped by none other than a highway man, being a bit of a firebrand Elizabeth can not believe the gall of this man and let us just say she gives him a piece of her mind – something which she does on repeated occasions with anyone who get’s in her way or when she sees an injustice. Apart from fuming over the vagabond nerve she is instantly transfixed by him, something about his arrogant charisma and his icy grey eyes – plus he is only taking from the parliament supporter! It’s not long into her stay that Elizabeth really comes into her own, she is able to help people with her healing skills – something that she was never able to do back home. But you can see that Elizabeth is restless she hates how her fellow secret royalists are treated and she wants to do more and then in a turn of events she starts harboring and helping fugitives. She risks her very life for these people but also in doing this her and James become closer, she knew right from the beginning who is was – that he was the highwayman that had a bounty on his head. There shared patriotic and rebellious nature bring them closer together and soon a firm and unbreakable bond forms. But can this bond and their love stand against what is yet to come in their lives? The relationship between Elizabeth and James is as pure as you can get, their personalities are so alike. Elizabeth and James’ love reminds of that part of Wuthering Heights when Cathy admits to Nelly she loves Heathcliffe and that lovely thing she says “My love for Heathcliff resembles the eternal rocks beneath…. He is my heart….I am Heathcliffe..” that sums up Elizabeth and James to me, they have this special and all encompassing love that takes so many different turns through the story and yet, how they feel for each no matter what they have gone through always is so true. Bazos has done an absolutely stirling job with them, not just as a cute as a button couple but their individual personalities shines through. James froze. That voice—with its unmistakable soft lilt. The most beautiful sound he had ever heard…. The story line is strong and enjoyable, it has many layers of what’s going on and each different segment of the story blends seamlessly with the other’s parts to create this stunning and original story of true love. I found Bazos to be a skilled and intelligent writer who enthuses her work with rich and textured detail, she takes you on a dramatic and heart wrenching tale of finding love and holding on to that love in the midst of true terror and tribulations. I have said I before, but I do love historicals that are rich in historical detailing and this is right up there with some of the best I have read, Bazos takes you on a journey through a time that was full of darkness and danger and amongst that danger you have a beautiful romance between two character’s who are hugely likable and your rooting for them to get their much needed happiness. I enjoyed the Traitors Knot so much and I cannot recommend it enough and I will certainly be reading more from Cryssa Bazos. This was an Complimentary copy from the author in exchange for an honest review. The Traitor Knot can be purchased at Amazon. This entry was posted in Civil War Era Romance, Complimentary copy, Historical Romance, Reviews and tagged Civil War Era Romance, Complimentary copy, Cryssa Bazos, Historical Romance, Review.